You finally took the plunge and got yourself an iPhone. Awesome. You'll quickly see how amazing this slick little device is. But take a stroll through the App Store and chances are you'll find yourself just a tad bit overwhelmed. Considering there's an app for, well, everything... how do you even know where to begin? Strange that this one isn't included with your iPhone, but it's the best safety feature you can have. Tied into the iCloud, this app will let you find and control your iPhone, as well as other Apple devices including an iPad, iTouch or even Mac. (Tough to misplace that last one, though!) Just install this app on any device, enter your credentials and it will pinpoint the location of your iPhone. If you're worried about someone stealing your lost phone and accessing all your data, the app features a remote locking aspect, as well as a way to remotely wipe your device to erase all personal data. 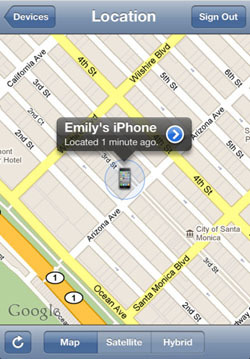 You can also remotely play sounds or send text messages asking for someone to contact you about your lost phone. Yes their IPO tanked and they're constantly making cosmetic changes to your profile, but Facebook is still the Biggest Gun in social media. With Facebook Places, updating your status on your iPhone is simple and even lets your friends know exactly where you are. An incredibly robust app, you can upload photos, send messages, add videos and write status updates, as well as check out what all your friends are up to, leaving comments and "likes" all over the place. You know an app's off to a great start when it has a powerful elephant graphic for its icon! This award-winning app is one of the most versatile and useful apps you'll ever download. What's it do? Well, everything. Basically, Evernote can be used in an infinite number of ways. 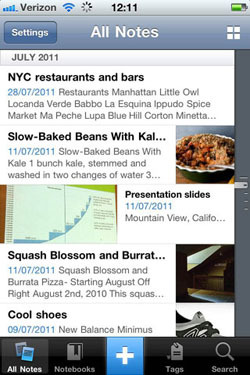 At its core, the app lets you take notes, save cool web pages, attach images, make lists and more. But it all syncs up with your other computers, smartphones and tablets so you can access your info anywhere, anytime. From shopping lists to recipes, you'll save and organize everything in your life, and best of all, it's all searchable. 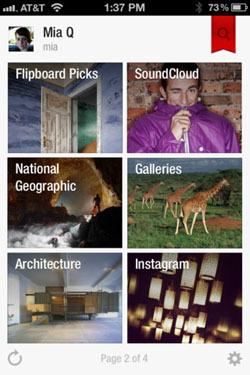 Mint.com is already an incredibly useful website, and the iPhone app continues that trend. 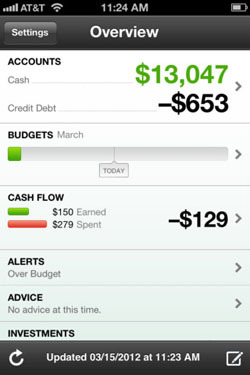 Now it's super easy to manage your personal finance by creating budgets and keeping up with expenses, all from your phone. Easily check your finances and decide whether Super Sizing that meal is even an option, right as you're placing your order. Budget yourself out and keep track with incredibly easy charts and graphs. Take a lot of videos or photos on your phone? 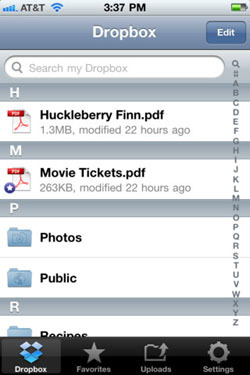 Make it super easy to share with friends, family or your personal computers by installing Dropbox. This free service acts as a virtual drive and lets you store documents, photos, videos or whatever else you want, with the ability to access it anywhere you can get onto that internet thing. You can make certain folders public or even share with a specific user, so no more worries about emailing huge files to one another. "What do you want to eat?" Easily the most asked question on a daily basis, and easily the most annoying question to answer on a daily basis. So don't. Let the Urbanspoon app do it for you. Just shake your phone and let the local restaurant slot machine pick a restaurant for you. Of course you can also browse restaurants by area, cuisine or even price, read reviews, see what your friends like, etc. It's just a wonderfully clean and slick app that's not too overwhelming at all. Perfect for aiding you in your dining decisions. Pardon the word choice here but this app is far from flashy. What it is, however, is an incredibly lightweight and straight-to-the point app. 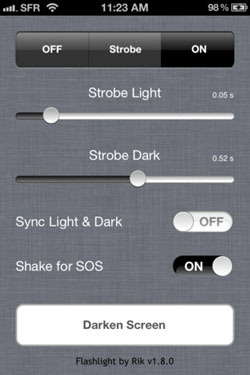 It turns your iPhone into a simple flashlight with three modes: off, on, and a strobe light effect. The only real customization you have is in slowing down or speeding up the strobe light. Considering most users would turn this on during blackouts or when trying to unlock their card doors at night, you don't need any bells or whistles. Just a light. Know those amazing iPhone commercials that promise the world with a mere swipe of the finger, leaving you drooling in your Cheerios at how unbelievably cool this smartphone is? Well the Flipboard app is just like that. It's just so incredibly fun and amazing to use and look at. Yes it provides great content based on your social networks and various digital magazine-type sites, but it also displays the information in a flippable magazine-like fashion. Flip a page up, slide it to the side for more information. It's really the Origami of apps. 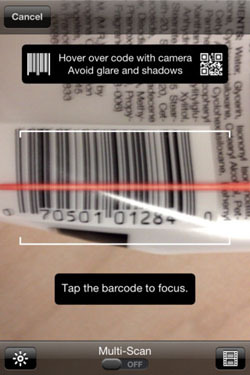 The RedLaser app is a barcode and QR code scanner, but so very much more. After scanning a barcode, the app will provide you with basic product information, as well as search thousands of online and local retailers to offer you a list of price ranges. At a store and not sure if you should buy that TV because it might be cheaper elsewhere? Just scan the barcode and you'll instantly know if any other stores (locally and online) have it cheaper. No flashlight by Rik at iTunes. 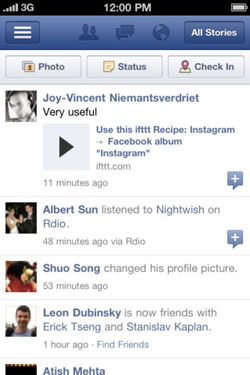 I also was not able to find Flashlight by Rik on iTunes. Just click the link in the article above and it will take you there. It says your request cannot be completed. To all of you who can’t find Flashlight by Rik, note that an iPhone 4/4S is required: they’re the only ones with an actual camera flash. If you do have a 4/4S and still can’t find it, please contact me right away by email (find it at http://henri.tel) and I’ll look to solve the problem.